Miele Vacuums Help Asthma Symptoms! Miele high-quality vacuums fight bedbug infestation! Dyson DC66 Multi-Floor Upright Vacuum helps to alleviate allergies! The Dyson DC66 Multi-floor upright vacuum is certified allergy and asthma friendly by the Asthma Society of Canada. To achieve the asthma and allergy friendly™ certification, Dyson vacuums undergo an independent program of rigorous tests. These tests cover the removal of allergen-containing test dust from carpets, levels of airborne allergens during vacuuming, filtration integrity, cleaning performance with when the bin is almost full, and the risk of allergen exposure during bin emptying. Dyson DC66 meets and exceeds the strict criteria for all these tests. Dyson DC66 upright vacuum cleaner. The product has a better overall performance than other vacuums with a great geometric ergonomics, perfect for carpet, hardwood, furniture and other surfaces. The vacuum has radial root cyclone technology, a unique arrangement of inner cyclones in a radial formation. This creates optimal airflow with improved efficiency, preserving air pressure and suction. With this extra function, the Dyson DC66 is super effective in removing dirt and dust from any surface in one sweep. The build of the vacuum also makes edge-to-edge cleaning so much easier. The vacuum head in the Dyson DC66 has been minimized to completely cover your surface and corners. ed dust remover and cleaner head are able to capture particles down to 0.5 microns. The product is incredibly effective when it comes to removing hair without tangling. The tangle-free turbine tool can remove dirt and hair without tangling the brush bar. This is perfect for pet owners. The Dyson DC66 is also packed with plenty of extra features. The vacuum has a simple hygienic bin emptying technology using nothing more than a button to release dirt. The unit comes with extra tools. This especially includes engineered vacuum tips for all your cleaning needs. Best of all, the product comes with no extra costs. The Dyson DC66 has phenomenal steering. It uses a ball in the steering system allowing you to navigate into difficult places with ease. It can be controlled solely by a flick of the wrist. Additionally, it has an instant release hose and wand. This makes cleaning up high areas super easy. The DC66 is a great product. With the advanced technology and features, the DC66 is a really easy to use and effective vacuum. When put to the test, the product manages to leave surfaces spotless, even the most difficult places to get at. The installation is a breeze. The Dyson DC66 is packaged as three pieced which snap together setup. The movement and control of the vacuum are incredibly smooth. The light and responsive steering make it a conformable vacuum to navigate with and can reach the smallest cracks. Additionally, it is incredibly quiet. Unlike most vacuums, this product is very subtle and will not wake anybody up at night. The Dyson DC66 is a great product. The integrated radial root cyclone technology creates great airflow and suction. The vacuum also proves effective in getting rid of allergens and dust particles most other products can’t clean. The device is super easy to use and set up with the click together installation and hygienic bin emptying technology. The last notable feature of the Dyson DC66 is the super responsive steering allowing for optimal control. 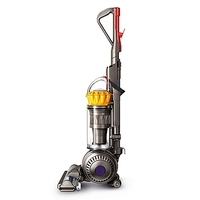 Conclusively, the Dyson DC66 is a solid option for anybody searching for a high quality and reliable vacuum.